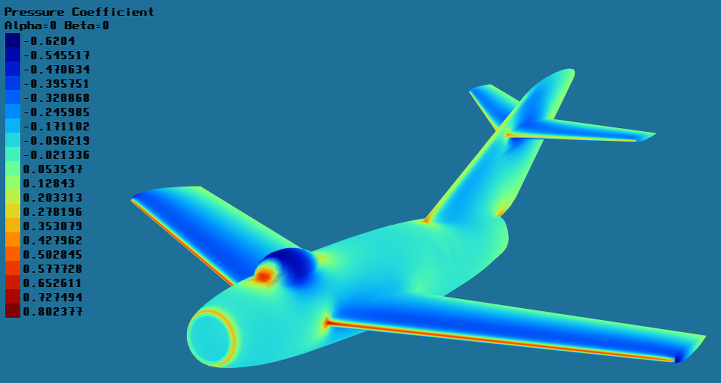 Apame is a 3D Panel Method program used for calculating aerodynamic forces and moments acting on an aircraft in flight. Apame can replace CFD programs (like Fluent, OpenFOAM...) for subsonic attached flows where calculation time is important and friction drag can be ignored (optimisation problems, conceptual desings, aerodynamic load generation...). The calculation time is much shorter compared to classic CFD; seconds vs hours. - Evaluation: for this purpose, ApameGUI graphic user interface is used to import already available meshes, pre-process it, send it to the ApameSolver and evaluate results. - Optimization: in this case, user-defined scripts are used to parametrically generate mesh and send it to the ApameSolver in a single optimization step. For this purpose, ApameScripts are given inside Apame package as a base examples. Programs are free, licensed under General Public Licence. You can find them under "download" section.